* Detailed description of each organ with beautiful illustrations. 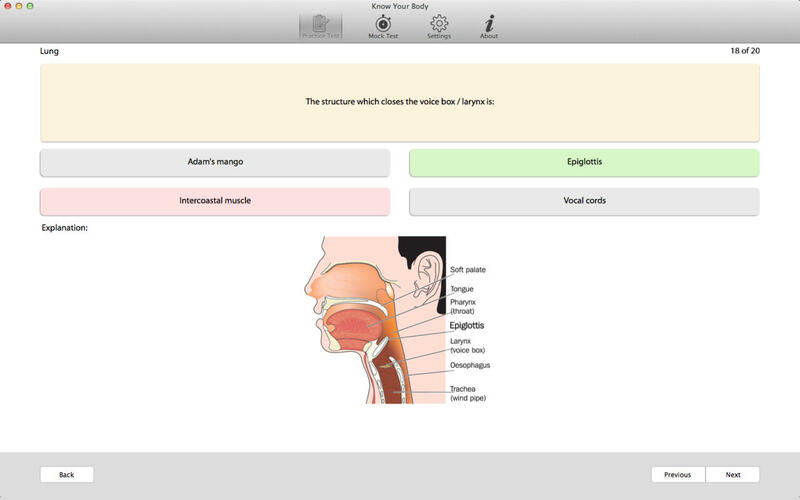 * Provides a valuable exercise for it tests your knowledge about the human body systems. * Contains over 500 multiple-choice questions based on information about their structure, functions, common ailments and their remedies. * Sensory Organ System: Ear, Eye, Tongue, Skin and Nose. * Digestive System: Throat, Stomach, Intestine, Liver, Pancreas and Eyetooth. * Endocrine System: Pituitary, Thyroid, Thymus, Adrenal are the four vital glands of internal secretion. * Reproductive Organ System: Breast, Ovary, Testis and Womb. * Circulatory System: Bloodstream,Heart and Lung. You can study the Know Your Body by topic. All questions are sorted by topic. Mixed test has questions from all topics. Questions are presented randomly from all the topics. The app records your progress as you start quizzing yourself. * Over 500 multiple-choice questions. * Choose number of questions you would like in each test. * Shows test results at the end of each test. * A new module, "Progress Meter" keeps track of how you are performing in a particular topic, and retry the questions you answered incorrectly. * Special algorithm that randomizes questions every time you take a test. * The slick user interface allows you to choose from possible answers. * The app is very interactive and needs minimum user input.